Enjoy a thrilling 55 mile aerial adventure of unobstructed views with this fabulous helicopter flight for two - perfect for those seeking a little adrenaline combined with stunning landscapes. Admire the views below as you climb to heights of over 1000ft and accelerate to speeds in excess of 120mph as you swoop over the beautiful landscape below. On this 55 mile journey you will be transported to another world with a bird’s eye perspective of the world. On arrival you will be welcomed and briefed by a specialist flight team and given the opportunity to see and hear a modern helicopter up close. 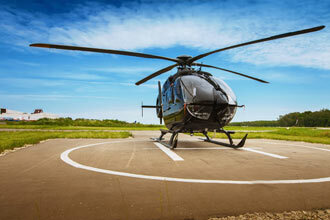 You will get the chance to have your photo taken with the helicopter before boarding for your flight. Once you are safely strapped in to your seat, then it’s up, up and away as your pilot takes you airborne. Depending on your chosen location you will be able to observe the local landmarks, take in the landscape and enjoy the thrill of being in a helicopter. Don't forget to take your camera, so you can you can re-live the experience with friends and family and show off your fantastic photographs.